By John C. Toman. Posted December 30, 2012, 3:22 PM. 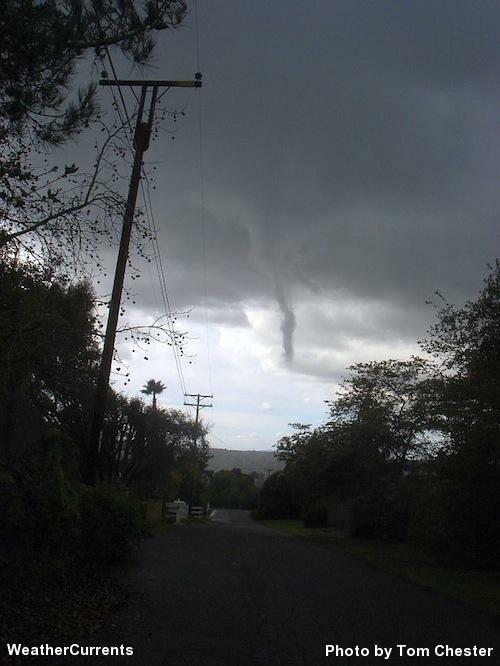 As part of severe weather trailing a storm Sunday afternoon, National Weather Service spotters reported funnel clouds over Murrieta, Fallbrook and off of San Clemente. In Fallbrook, the funnel cloud appeared around the same time hail fell, as thunder and lightning marked the one o'clock hour thunderstorm. WeatherCurrents' Fallbrook station went offline shortly afterward, the victim of a power outage. Additional rainfall was spotty, with De Luz at 0.19", Fallbrook and Temecula recording 0.13", Wildomar and City Heights (in San Diego) registering 0.10", and Murrieta at 0.08". Totals were slightly less across the rest of the inland valleys. As the weather cleared somewhat in the afternoon, snow was visible on parts of the Ortega Mountains, part of the Santa Ana Mountain range, above Lake Elsinore. 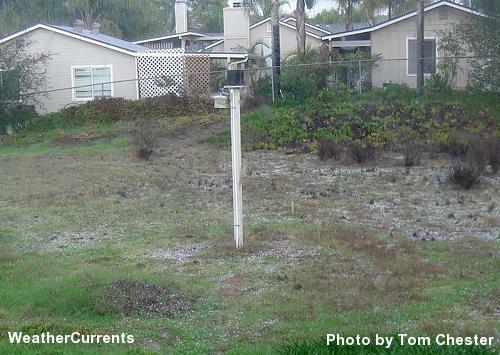 There's also an as-yet unconfirmed report of what may be snowfall in the De Luz area, west of Temecula. The chance of showers decreases and tapers off tonight in the region. Here's a video of the funnel cloud over Fallbrook. Thanks to Tom Chester, Scott Chester, and Rick Guild, who contributed to this report.